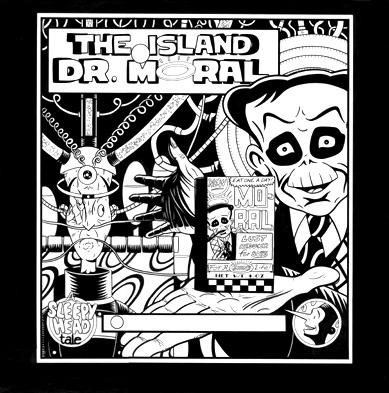 This is the cover to The Island Of Dr. Moral, the 1994 Fantagraphics trade paperback collection of weekly A Sleepyhead Tale strips that ran from May 1991 until March 1992, comprising a forty-one chapter story. 12 1/2" x 12 1/2". India ink on bristol. One small piece of pasted-on art. Small bits of white-out.